Lucky for you, your month just got a little brighter thanks to Winmo’s predictive sales intelligence platform, WinmoEdge. Starting this month, we’ll be rounding up business opportunities in order to #EDGEucate you on actionable predictive insights each month, giving you a taste of what WinmoEdge has to offer and a leg up on your competitors. The predictive sales intelligence provided in WinmoEdge is reported on and tracked by an expert team of researchers that provide daily updates that could change the prospecting game for you and your team. Our information is always up-to-date with contact information, insight on key decision makers, and the latest strategy shifts and roster changes. Our goal is to make sure you know how, when and what to pitch before anyone else. If you see something that strikes your eye this month, request a Winmo trial and discover even more opportunities highlighted within the platform. Don’t miss monthly chances to #EDGEucate yourself on the latest and greatest reports. Heineken is preparing to launch its new alcohol-free line of Birra Moretti across the UK in March. A campaign is set to run digitally as the products roll out in stores. The company’s total spending has remained consistent over the last couple of years. In the first half of last year, £8.4m was spent and the top channels which took up most of the budget were TV (£3.5m), cinema (£2.1m) and outdoor (£1.3m). According to reports, Heineken has invested more in digital within the last year than it did in the last two. Aside from this, the company also promoted a few marketing managers in recent months. 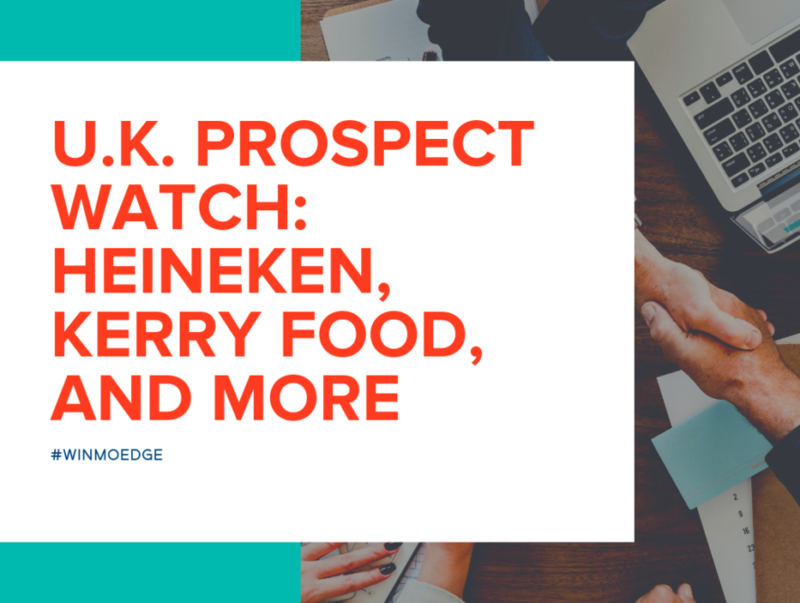 Since Heineken spends more in Q2-3 throughout summer campaigns, so we advise that you get in touch to secure revenue. Time’s ticking and planning is likely underway now. Our Edge team warned that Gocompare.com may review its accounts after the appointment of CMO Zoe Harris last summer and they were right! The price-comparison site is looking for an agency to support its creative efforts. GoCompare has spent £14.3k YTD on desktop-and-mobile-display, according to Adbeat. This is well down from the £101.2k spent in the previous 12 months. The site places its ads programmatically. GoCompare released its ‘Onwards & Upward’ spot at the top of the year and although Q1 is the peak spending period, it would be wise for sellers to approach to catch pounds throughout the year. Kerry Foods may be getting ready to make some strategy changes since Managing Director of Brands & Chief Marketing Officer Nick Robinson was promoted from CMO at the start of the year. These shifts signal opportunity for a review predicted within the next 9-12 months. The leader in global food markets is ready to expand into more retailers. It recently acquired Southeastern Mills’ SEM plus Ariake USA for about £286m. Kerry Foods’ digital display spend for the last year is low with a total of £501 and 99 percent of the ads were placed programmatically. According to Adbeat, ads over the last 24 months totaled £569. Last month, the company acquired Southeastern Mills’ SEM and Ariake USA, leading to even more effort to engage their target demographic of mothers and families. Sellers should watch for reviews and shifts as the new CMO settles into his role. We also encourage you to go after last-minute Q3 opps. Be sure to mention radio, press, cinema, and TV when talking about channels to lean on. Theorem Solutions manufactures products and solutions that aid in the leverage of a company’s CAD and PLM assets. The service provider appointed Chief Marketing Officer David Francis last November after expanding the leadership team in 2018. The company also hired a number of new marketers to assist the new CMO so agencies and martechs of all sorts (media, creative, digital and PR) should approach to pitch for the business. With all the changes in leadership, new product updates and launches are inevitable. Press and online sellers specifically are encouraged to make moves immediately since these are proven marketing channels within a B2B and technology company. The luxury whiskey brand under The Edrington Group, Macallan, launched its first global campaign with the help of new global creative AOR J. Walter Thompson. The agency launched the “Make the Call” ad in Dubai but the campaign will expand to the UK, Taiwan, the USA, Mexico and China across TV, cinema and digital. Macallan’s releases new products consistently throughout the year and targets affluent millennials. There should be an increase in travel retail marketing in the near future and it’s good to note that the majority of Macallan’s budget goes toward digital channels. Marketing director Glen Gribbon reported that areas of focus over the next few years include personalization, storytelling through social, and increased loyalty through CRM programs. Branded media spend has increased and the company has promoted a few members of its marketing department. Nielsen reports Macallan spent £71.2k on measured media in H1 2018, which consisted of outdoor (£63.8k) and press (£7.4k). Don’t let the opportunity to drink up pounds pass you by, with an expected increase in global digital spend as well. Pynk, the newly-formed retail investment fund, will be launching sometime this year. The company’s leadership team includes Co-founder & CMO Mark Little, Co-founder & COO Rupert Barksfield, CEO Seth Ward and Director of Product & Co-founder Philip Fletcher. We urge agency and martech readers to approach because the company is new and its accounts might be up for grabs. Those who are interested in vying for a spot on the roster should approach since new leadership could initiate reviews. Be sure to keep an eye out for new marketers in the meantime. The top of the year and the end of the year tend to be the times when financial companies spend the most. So if you approach for upcoming Q4 opps, suggest a strategy with a major focus on press and online campaigns. Hope is a Staff Writer and New Business Analyst for WinmoEdge UK.